We were greeted with our first rainbow on Maui when we looked out our balcony window this morning. Not long after there were several sail boarders and kite surfers just off shore as well - and it seemed they stayed out pretty much all day! We used up some of our eggs & bacon for breakfast and then drove down a few minutes to the area of Kaanapali, which seems to be mainly resorts but it advertises a place called Whaler's Village and Museum, which sounded quite interesting to me. Turns out that that the museum is no more (taken over by an escape room) and the 'village' is a bunch of shops in an outdoor mall. Nice stuff though and we picked up a couple of things including T-shirts made from bamboo. Next we drove a little further south to look one more time through the downtown of Lahaina. We were surprised with the lack of people compared to when we've been there previously, maybe because it was only the morning. Made a few more purchases and then headed back to the condo for a late lunch. 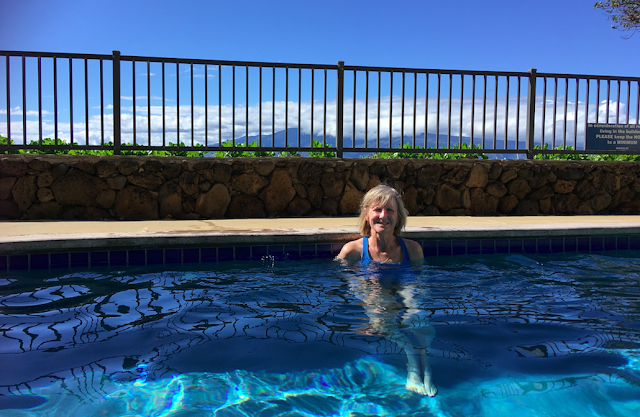 Then it was down to the pool for some sunshine on our last day here and a final dip in the water for me. I divided my time though between the pool and the hockey game. 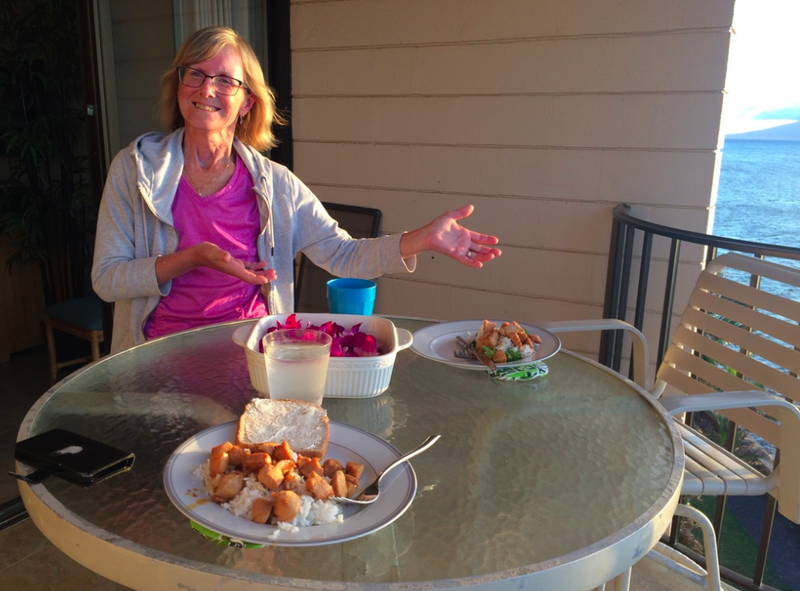 Beth talked to a couple from Minnesota who are here for a few more days and so she gave them our few leftover food items. I guess tonight we'll have to begin packing up. 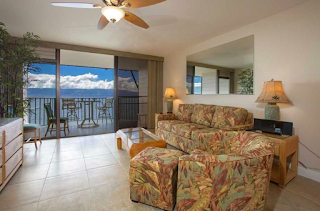 We need to be out of the condo by 11:00 tomorrow morning and then we'll head over to Kahului to hang out before taking back the car and heading to the airport around 3:30. Our flight leaves at 6:10 but we have a 3 hour layover in Honolulu, a 5 hour flight, a 3 hour layover in San Francisco, and a 5 hour flight into Toronto, arriving there at 3:30 on Friday. With the long layovers at least we shouldn't have to run to connecting flights. We've had such an incredible time on our holiday in Maui, getting to see pretty much everything we wanted to and exploring almost the entire island. It meant for some busy days but each was a wonderful experience that we so enjoyed sharing together. The weather has been warm and sunny and the scenery is amazingly beautiful. 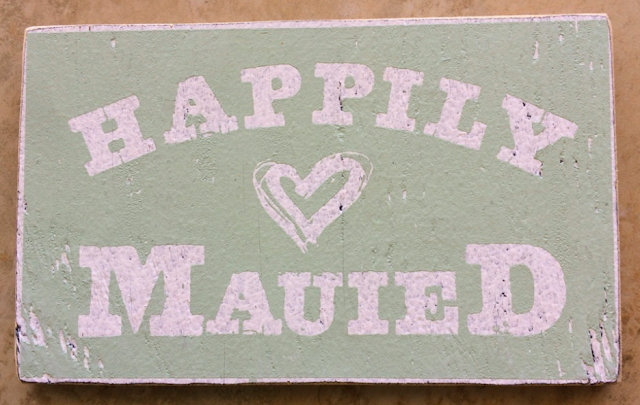 At the luau somebody asked what my favourite part of Maui was and I had a hard time answering. I ended up saying that it was pretty fantastic to see the almost continual whale activity out our window each day. Today I said I was quite thankful to have been able to wear flip flops for the last 10 days. I guess it's back to boots soon. 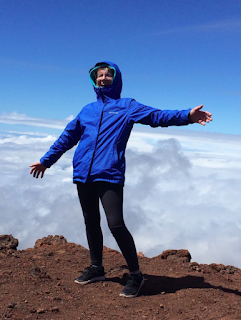 We had a great day going up to the top of Haleakala today (the photo on the right is of Beth at the summit, bundled up as it was chilly). We left the condo by about 8:30 and were gone for 8 hours. 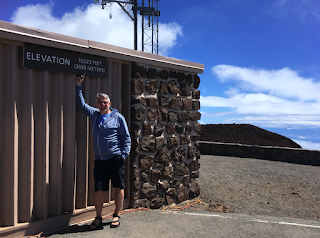 We had to drive to north central Maui again to catch the Haleakala Highway east of Kahului and then begin the ascent, which is apparently the steepest in the world, rising to above 10,000 feet over 38 miles. It is quite a road - well-paved but with no shoulder, and while the first part had some guardrails, once you enter the National Park you're just driving right along the edge of a sheer drop (so obviously the driver has to maintain a sharp focus). Also, you're literally driving into the clouds - we had great weather for the day, with bright sunshine as we drove up. We used the Shaka Guide app again which had great commentary and suggestions. Our second hike was at Leleiwi Overlook, which from the parking lot looks like you walk off the earth! But it leads to a stony path with a pretty good incline and ends with a spectacular view of the crater. With the thinner air at this elevation Beth did find the uphill climb to be a bit more of a challenge, stopping along the way to catch her breath. 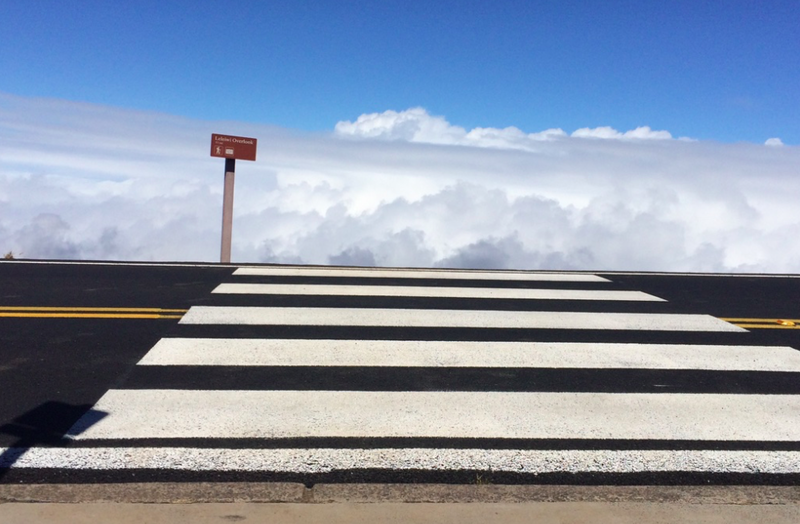 The crater of Haleakala doesn't look like what most people imagine when they think about a volcano as it's so big (apparently the island of Manhattan could sit inside of it). Still, when you look down into the crater from the height we were at, it was incredible. Since it's been dormant for over 400 years there is actually lots of green vegetation growing inside of it. It was also full of clouds and you could even see the clouds form and rise over top of the lip. 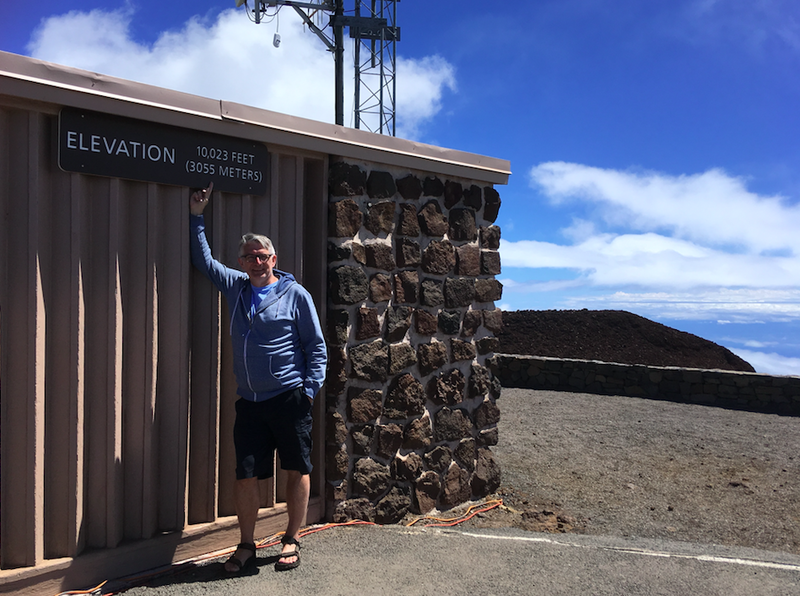 When we got to the Visitor Center just below the summit we sat in the car to eat our sandwiches before looking around that area. We decided not to partake in any of the trails around there and made the short drive to the top of the mountain, where we took in the awesome views. There were lots of clouds below us so you couldn't see into the distance very well. The temperature was about 50 degrees Fahrenheit with a brisk wind to make it feel even cooler. Then we headed back down the windy road (with lots of what they call switchbacks) and it seemed to take quite a long time to descend. 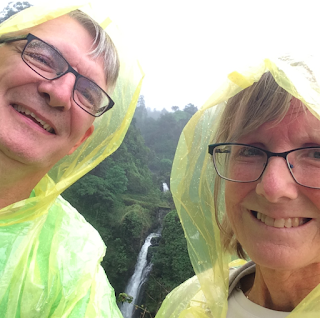 We also ran into rain part way down and it continued until we were almost back to Kahului. We took a side trip into a 'cowboy' town (founded by cattle ranchers) called Makawoa but didn't get out, and ended up in a traffic jam so we just turned around. We also visited Hookipa Beach about 5 miles east of Kahului as it's renowned for its surfing, but when we got there nobody was in the water and signs on the beach indicated the surf conditions were too dangerous. 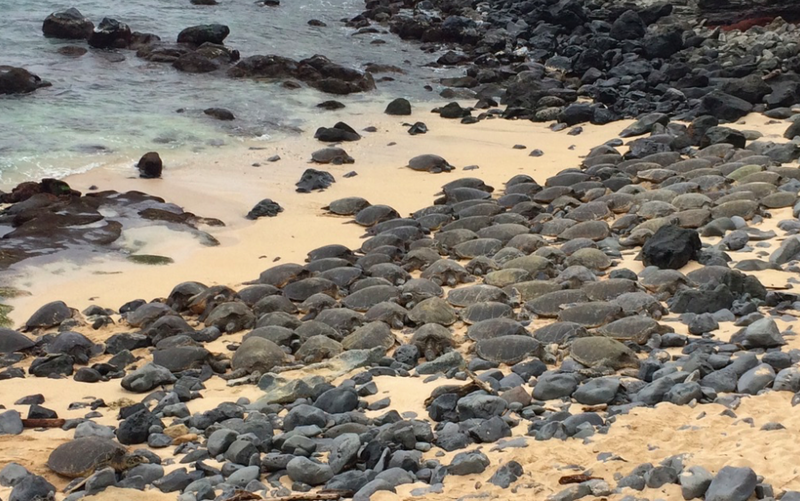 However there was a crowd of people at one end of the beach and when we walked over to see why, we saw that there were about 150 huge sea turtles laying on the shore! 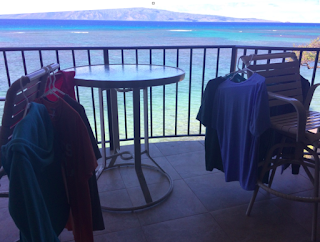 Today it was time to just relax and hang around the condo. 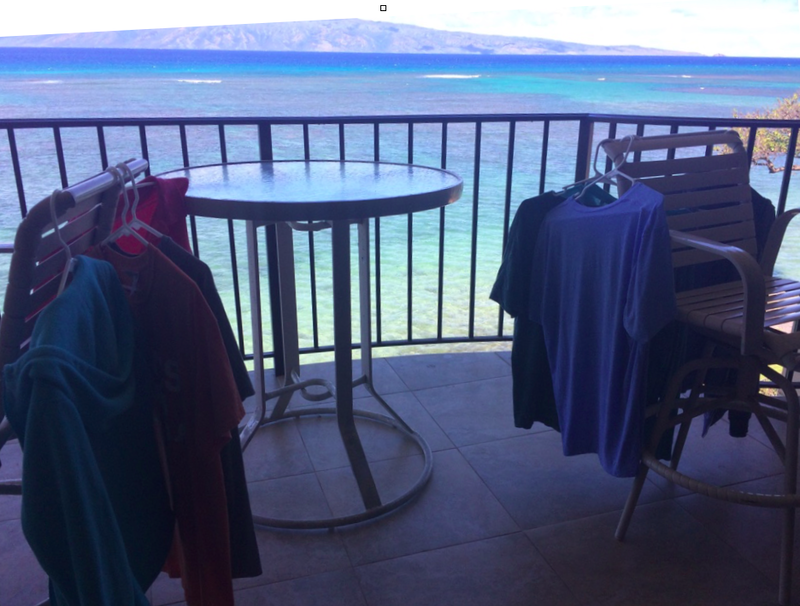 In the morning I worked on the blog and Beth used the coin-operated laundromat in the building (check out the view behind our fancy drying racks). This afternoon we went down to the pool for about 2 and a half hours. The sun was pretty hot again so I was in the water a lot, but the big news is that even Beth went in for a little dip. When we went back up to our room I watched the Maple Leafs win and we tried to connect with our children, and my mom as well. It was great to hear their voices and catch up a bit with what's been going on back home (apparently there's a big part of a tree in our backyard). 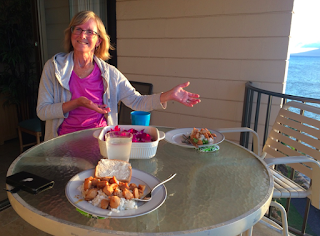 Beth made a great supper and we decided to eat it out on the balcony with the beautiful sunset as our background. Later in the evening we drove south about a mile or so to a community called Honokowai, but really the road is just one continuous line of condos and resorts along the water. The one we're staying in is, of course, our favourite - our balcony is literally 8 metres from the water! We feel so fortunate to have found it on such short notice, as we only planned this trip one month ago. We picked up a few items at a grocery store in town, but we have to plan carefully as we only have a few days left to eat up all of our food. Tomorrow we hope to travel up the tallest mountain/volcano on the island but it looks like the weather may be rainy so we might have to postpone it a day. We actually used an alarm to wake up for the first time since being here, but we wanted to get a bit earlier start as we were going to be making the long journey to the opposite (ie. eastern) side of the island. 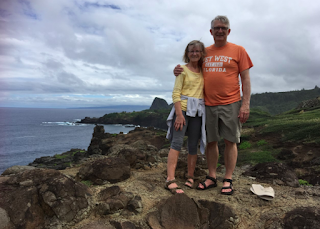 It's a famous stretch of road called the Road to Hana but we first had to drive about an hour to get to the starting point near Kahuliu (central Maui, where the airport is located). We gassed up and began the tour by about 8:30. We used an app on Beth's phone that we had downloaded (at Josh and Jess's suggestion) called the Shaka Guide. It uses your GPS location to trigger commentary about the area you're passing through and it was a phenomenal help. Over the course of the day it came on about 150 times, sharing history, tips, don't-miss-locations, and great Hawaiian music. The road is well paved, but fairly narrow (no shoulders to speak of usually), extremely curvy (apparently about 620 in total!) and over 50 one-lane bridges where you have to yield the right of way if someone is coming from the opposite direction. It's a pretty busy road but most of the traffic is going pretty slowly in one direction and you are spread out over many miles so you only notice the traffic when you stop to see something. The picture above (of Queen Elizabethamahama) was taken down a side road (to Ke'anae) where you could see the large larva rocks along the shore and fields of taro patches from the road above. Another cool stop, this one right along the road (and with no admission price), was climbing through a lava tube. Apparently these are formed when still molten lava bores through some of the already hardened rock. 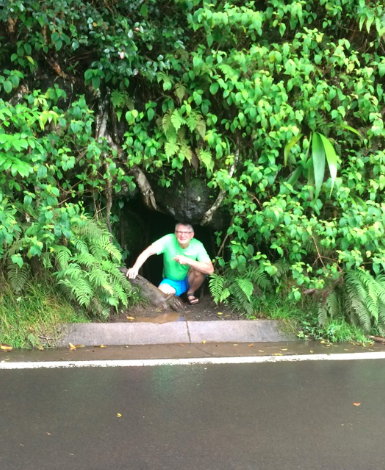 This is me at the entrance and it was basically a cave that wound back about 50 metres and was often tall enough to stand up in. When it opened up, it was to a jungle at the end. We made our way back through the tube to the road. Oh yeah, I should say that we definitely were travelling through a rainforest, as the east side of the island gets a lot of more rainfall than the rest (like 300 inches/year vs. 30 inches). Wise Beth had brought along some fashionable yellow ponchos that were a big help in keeping us dry on walks/hikes we took early on. One suggested excursion took us down to the village of Nahiku which had been developed 100 years ago as a short-lived rubber production area. The bridge was out so we had to walk down to the shore. The road was lined with homes of the local people. It was interesting to see how they live - lots of vegetable gardens, fruit trees and of course flowers. The end of our walk brought us to yet another beautiful view of the ocean. On the way back out our Shaka Guide told us that back in the day George Harrison had bought property in Nahiku in the 1980's and came here to escape. Apparently he even donated a stone glass window in the small village church. Another nice, isolated hike we took was to a 'secret falls' recommended by our digital guide. It was definitely raining for this one but the path was wide and rocky so easy to navigate (although a bit steep at times). Further on down the road we stopped at the very busy Wai'anapanapa State Park and stood in line to use the washrooms. We had a great parking spot so went back to the car to eat sandwiches that Beth had packed and then headed down to the black (yes, black!) sand beach. It was formed long ago when the rough surf pounded on a fresh bubbling lava flow and then the waves continue to grind the rocks to a smooth sand. I felt that I should really take a swim at this unique beach so took a quick dip. We didn't actually stop right in Hana on the way in but did go in to the (apparently) famous Hasegawa General Store (established in 1910 with seemingly few updates in decorating since then) and bought some chocolate macadamia nuts. 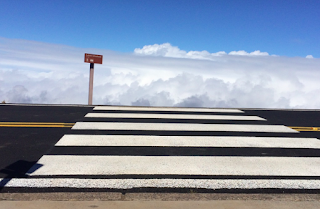 We drove past it for a fair distance as recommended by the audio guide, as far as Haleakala State Park. 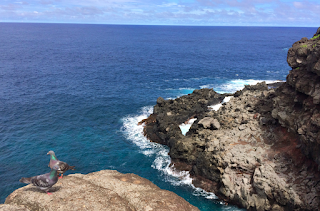 We took a hike down to the Seven Sacred Pools of Oheo Gulch where there were many people bathing or swimming in the water and a couple of local surfer dudes jumped off of some cliffs. Then we headed back home, which felt like a pretty long drive as we didn't make stops along the way like we did on the way in. The audio guide was a good companion though as he filled us in with stories about the history of Hawaii. Beth was amazed by the bamboo growing along the roadside as well as the flowering trees and shrubs tree. One type of tall tree had bright red flowers way up in their canopies. In total we spent 10 hours going back and forth on this road - and amazingly we used a 1/4 tank of gas! When we got back to Kahuliu we drove around the town for quite a while looking for somewhere to eat (and take a leak!) and in the end had to settle for McDonalds. In reality it just felt good to get out of the car for a bit. We still had another 45 minutes or so of driving back to Kahana in the dark. What was most fascinating about that part of the trip, was the way the side of the mountains were all lit up with tiny lights, which must be from the surprising number of people who live up there. We got back to the condo pretty exhausted, plus I had the beginning of a sore throat and a stye in my right eye. Beth gave me a much appreciated shoulder massage, and with some Vitamin C and warm compresses to my eye, I'm feeling quite fine this morning, but we don't plan to go anywhere but down to the pool today. We lathered on the sunscreen and spent a good chunk of the afternoon down at the pool. I listened to some tunes and did some puzzles but every 10 minutes or so I needed to take a dip to cool off. We went over to the beach briefly so that I could say that I swam in the ocean here. Beth just soaked up the sun (no water activity for her) and visited a bit with other people at the poolside. 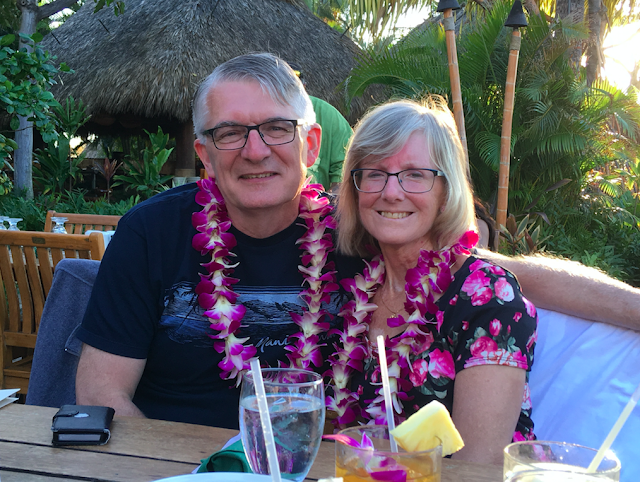 Then we got cleaned up and drove down to Lahaina to take in a traditional Luau which we had booked when we first planned our trip. It was a very impressive evening. We were greeted with leis and drinks and chatted with our server named Ridge who was local to the area. The buffet was really good with lots of selection for even this picky eater. We were at a table with a young couple from Utah (she was an obstetric nurse and 5 months pregnant) and a family of 5 from San Francisco. The dad was originally from Long Island so was a hockey fan and seemed to sincerely wish the Leafs well this season. After the meal they put on a phenomenal show, portraying much of the history of Hawaii using live music, singers and many dancers. Lots of colourful costume changes, traditional songs, excellent sound and musicianship - it was quite the high quality production from beginning to end (these things are a bit pricey but it really was worth every penny - American penny obviously, as such a coin no longer exists in Canada). 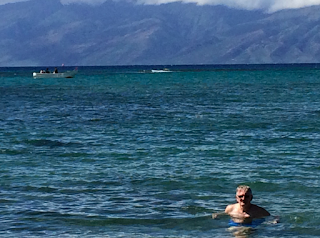 Laid low yesterday (Friday) morning as well, getting away by 11:15 to visit the Kahului area. It's in the middle of the northern part of the island, where we flew into, and is a bit bigger town with all the amenities (including Costco and Walmart, not that we went there). Outside of town is the Alexander & Baldwin Sugar Museum, and we had free admission because we bought a little "passport to the past" when we visited the Baldwin home earlier this week. It had lots of interesting information and exhibits (did you know that part of the harvesting process actually involves burning the plant?). Alexander & Baldwin were sons of missionaries who went into business together , in the 1830's, to harvest sugar cane, which became a very big operation with immigration to provide workers and later unionization unrest. I was again glad to have read James Michener's book as he captured some of that history well. It was also interesting to speak briefly with the lady who was the ticket taker as she grew up with (Japanese) parents and grandparents working the fields. She explained how her husband was of Norwegian descent as his grandmother (Japanese) fell in love with one of the European overseers on the planation. This kind of thing happened throughout Hawaii and has resulted in a very ethnically diverse population. The last plantation was closed in 2016. Its not cost effective to produce it here anymore, as it has to be shipped to mainland to be refined, then shipped back here again. 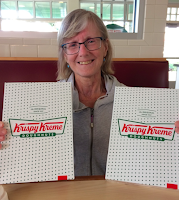 Then we headed into Kahului and got lunch at iHop (Beth had a coupon, however it was only good for after 4:00, but she was hungry so we went in anyway). Afterwards we walked around the little strip mall, and even though we were very full, we found the local Krispy Kreme. I find it funny that Beth has such a craving for these sugary delights whenever we are in the US (and it was especially appropriate after visiting a 'sugar' museum of course). BTW, I don't mind the donuts too much myself. 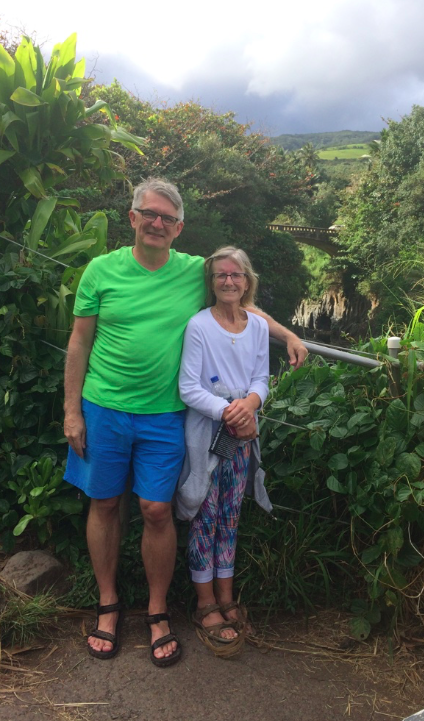 Next we drove over to the Maui Tropical Plantation where we took a 45 minute guided tour around the farm. We learned lots of interesting facts about the various fruit & nut plants and trees, like bananas, papaya, pineapple, that are grown on Maui. 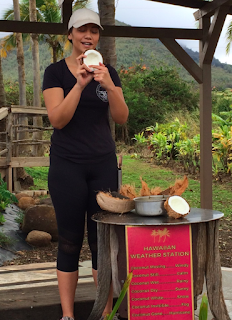 Our excellent guide even demonstrated how to open a coconut. 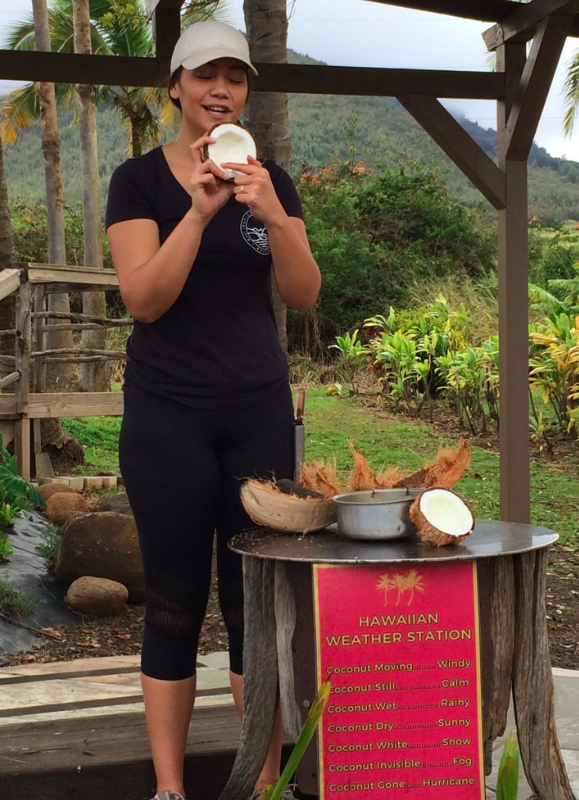 We were surprised to learn how long it takes for many of the species to begin producing fruit and that 150 people per year are killed by having coconuts fall on their heads (a fact I later checked online and found out is way overinflated). Afterwards we browsed around their large gift shop and Beth got a couple pieces of jewellery. 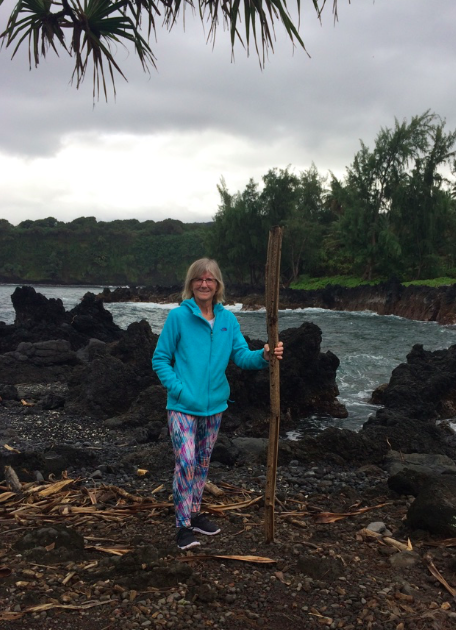 Then we headed back home for a quick break and for Beth to put on long pants before driving back down to Lahaina (about 10 minutes away) to meet the artist Robert Lyn Nelson at the gallery we had visited earlier. We got to chat with him for a few minutes and he seemed pretty down to earth, but definitely a driven individual - he has produced about 10,000 paintings! 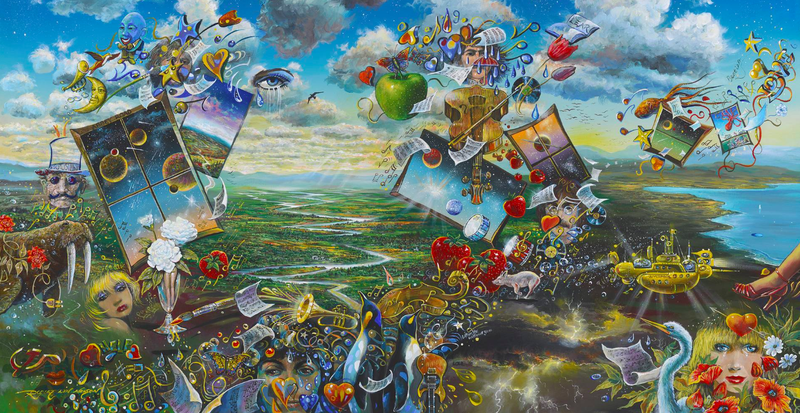 He showed us some recent works on his phone and had brought a large canvas along with a Beatles tribute painting called 'Come Together' that he had just completed that day (the one I've included here is 'Magical Mystery Tour' - also at the gallery). Before heading back to the condo we stopped in at one of the tourist gift shops (ABC store) and picked up a few souvenirs. I waited until this morning (Saturday) to write and have been sitting on the balcony while working on this journal entry. Right now it is just after 11:00 and with us facing the west side of the the sun is just now coming around to our side of the building. But the view, again, is phenomenal and there have been literally dozens of whales visible, including many that are breaching out of the water and, one of them pretty close to shore. We took a break and had a slower start this morning. I made us some egg mcmuffins (for those who know my lack of cooking skills this was a nice gesture on my part). We're really loving our condo - maybe I've said it already but the view is so amazing and we continue to see lots of whale activity out in the water off the reef. Today as we looked out while eating breakfast there were even some kayakers and paddleboarders heading out towards the whales. It was kind of cloudy this morning but later on we decided to explore the area north of us, so Beth packed us some sandwiches and we headed out. 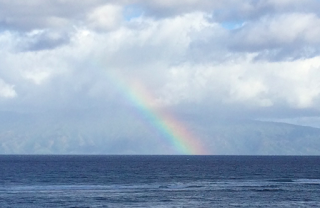 We drove along the ocean, north of Kahana. Our first stop was Honolua Beach and was about 20 minutes up the road. 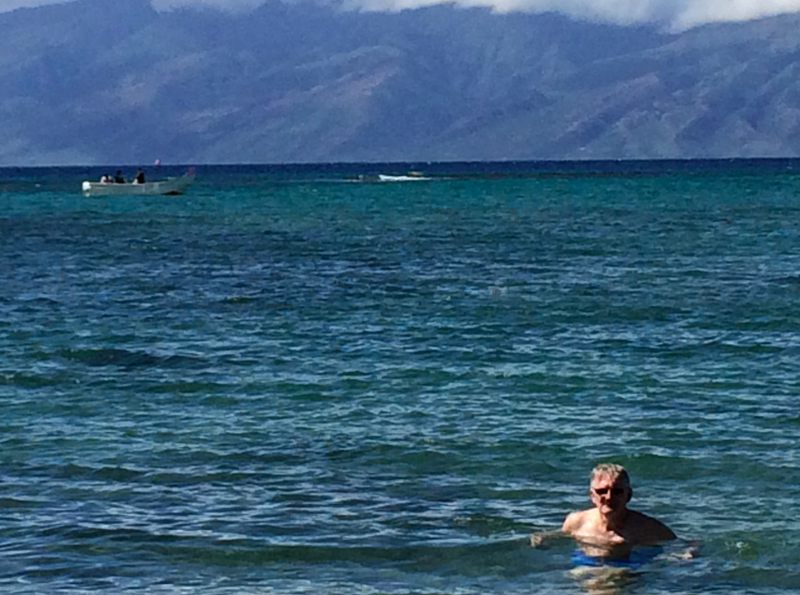 It was a smaller beach in a bay and wasn't too busy, but it did have a life guard -not that we needed one:). There were 4 people surfing, and it was interesting to observe how they waited for waves and their techniques for riding them out. There were also whales spouting, flippering and breaching out in the water beyond them. We just stood there and watched their amazing behaviour for quite a while. Then we headed out on our adventure along a long and winding road. It was a well-paved 2-lane road with a few one-lane bridges but it had many sharp curves and the landscape was just outstanding. To our left was always the beautiful blue ocean and to the right were combinations of black lava rock, trees, red dirt hills, and long grass that came right up to the edge of the road (Beth could have reached out and grabbed some). 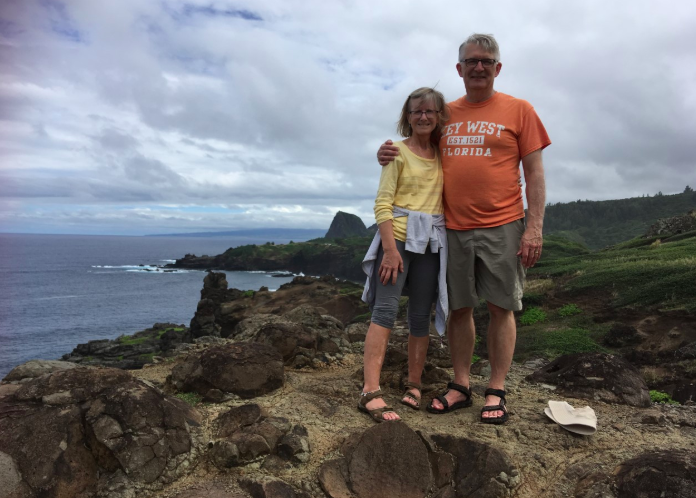 There were regular places to pull off and take in the scenery, which we did, but our main destination was the Makalele blowhole. We parked in an area that we thought had a path to the blowhole but it turned out to be a bit before it. It was a 4 minute hike to a cliff overlooking the water but there was also a steeper path heading north so I checked it out while Beth waited. I ended up looking over a pretty isolated cove and almost walked right into 2 doves sitting on the edge of the rock (who didn't seem to want to fly away from me). 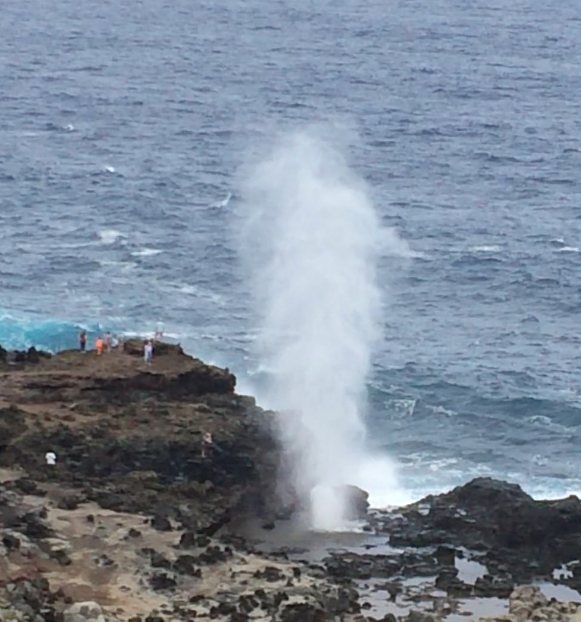 We got back in the car and ate our lunch, then drove a bit further and came across the parking lot for the actual blowhole but kept going because Beth wanted to check out the Ohai Trail that she had read about and was a few miles (and many curves) further on. We decided to give this 2 km loop a try and it was a great choice (but a fair bit of work, with lots of inclines, and pretty hot - we both ended up with sunburnt faces as well). There was a wide variety of flora and terrain, along with some muddy areas from the recent rain. At about the halfway point we were rewarded with some whales not too far off shore who were breaching (where they leap out of the water and splash back down). We were also reminded about how thankful we are for Beth's surgery last year which ended up improving her breathing because she doesn't think she could have done the trail before that. Next we drove back south and stopped at the blowhole, and it was pretty spectacular. It's a bit of a hotspot for tourists though so was pretty busy. There are signs warning to not get too close as there have been some deaths there in recent years. A lady behind us took a tumble and had a lot of pain in her foot so nurse Beth was quick to help and I, along with another fellow, gave her our shoulders to assist her back to her car. From there we drove back to the condo and when we got back Beth made a delicious chicken fajita supper (while I took a shower and then watched the third period of another Leafs' loss). Around 7 o'clock we took a little walk in the dark to the south of our place to where there is a small plaza with a general store and McDonalds. We got some ice cream and as we sat there eating were struck by how odd it was to hear Hawaiian music at a McD's.